Nick Ventner is a drunk with a blatant disregard for others. He's also damned good at hunting creatures that aren't supposed to exist. From amateur necromancers in the bayou to Sasquatch impersonators in the Pacific Northwest, Nick's seen it all. Even if some of the details might be a little fuzzy. In Whiteout, Nick faces his greatest challenge to date. Accompanied by his trusty mountain guide, Lopsang, and his testy apprentice, James, Nick journeys into the Himalayas to settle a matter of pride and payouts, as he searches for the lost riches of Shangri-La rumored to lie within the mountain's peak. However, the sudden arrival of Nick's greatest adversary, Manchester, complicates matters, and pits the two in a race towards the top, and both soon find that they have not just one another to contend with, but also a mythical and elusive yeti that has been terrorizing the mountain. 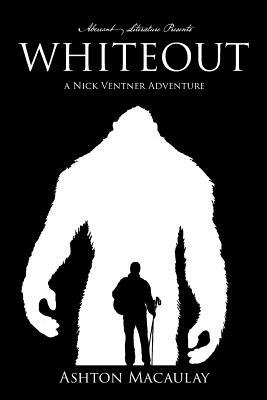 Featuring death-defying obstacles, hair-raising encounters with creatures from beyond, and a heavy dose of sarcasm along the way, Whiteout is sure to satisfy anyone looking for a fast-paced adventure novel brimming with action, suspense, and imagination. Not to mention the occasional whiskey on the rocks.